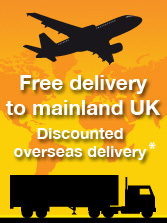 Desk Calendars such as the Popupmailers.co.uk Push Up Pen Pals make superb business marketing products in their own right. Sending the push up pen pots out flat keeps postage costs down, yet with a simple 'push' the desktop penholder will take shape for your customer in seconds. 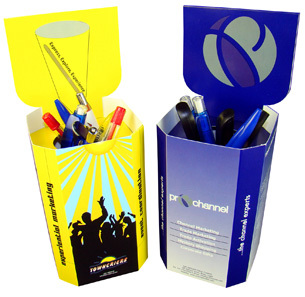 A desk top pen pot makes a useful everyday item that your customer will want to keep and use - keeping your company name and promotional message along with it! 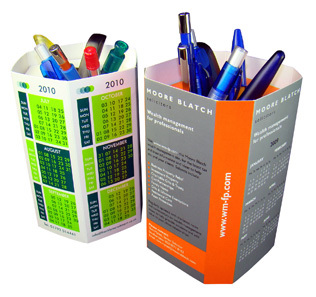 To make this business to business promotional item twice as irresistible just add a calendar to your Popupmailers.co.uk pen pot artwork. These 2-in-1 desk calendars will work hard for you for at least one year, although from our experience the additional purpose of the pen holder means it will be kept long after the desk calendars have expired. These business to business promotional desk calendars will remind your customers about your company every time they reach for a pen or a pencil. 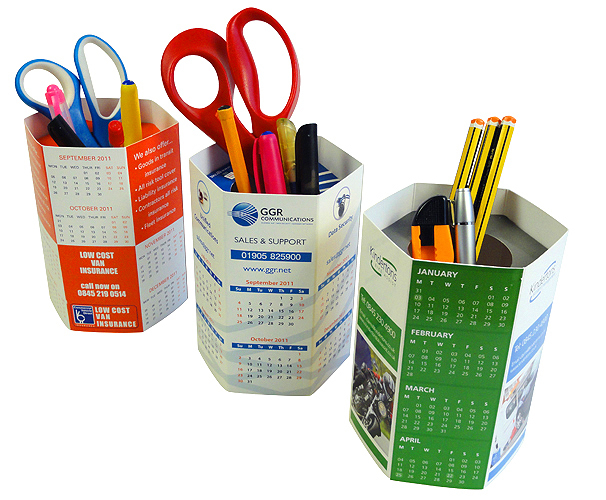 These Push Up Pen Pal desk calendars from Popupmailers.co.uk attract attention from your customers and their colleagues every day; advertising your company in a useful and effective way. Sometimes company promotional products and promotional business gifts are cast aside without a second thought, but the Push Up Pen Pal desk calendars stand proud and tall. 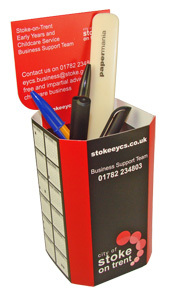 They are available as four, six or eight sided promotional pen pots and also with or without a header card - the choice is yours. 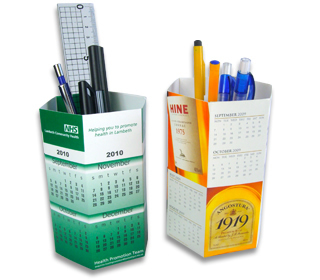 These stylish Popupmailers.co.uk desk calendars are not only popular during the festive period but are also widely used in event marketing as trade show invites and business event invitations. If you highlight the date/dates of the exhibitions or events the invited guests cannot forget and footfall numbers are increased greatly. 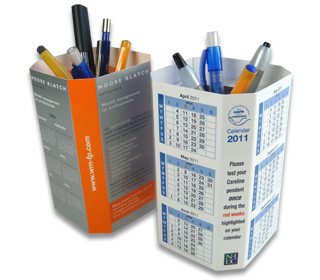 The Popupmailers.co.uk Push Up Pen Pal with header card is a desk calendar particularly suited to this format since it has extra printing area to publicise your event.